We would like to invite you to a private showing of “Practices of Everyday Life: Cooking”. It is an interactive musical performance containing live and synthesized audio and video. However instead of witnessing zombie artistss performing on laptops, you will encounter an augmented kitchen table around which a chef cooks a delicious meal and in effect performs a concert. On Tuesday July 9th at 4PM and Monday July8th 3PM come and experience the full piece in it’s current state in an informal private showing and leave us your feedback. The piece runs for about 40 minutes. We have included more information and details about the performance down below if you wish to explore more. A performance choreographed around a chef and sonified objects: fruit, vegetables, meat, knives, pots and pans, cutting board and table.Cooking*, the most ancient art of transmutation, has become over a quarter of a million years an unremarkable, domestic practice. But in this everyday practice, things perish, transform, nourish other things. Enchanting the fibers, meats, wood and metal with sound and painterly light, we stage a performance made from the moves(gestures) of cooking, scripted from the recipes of cuisine both high and humble. 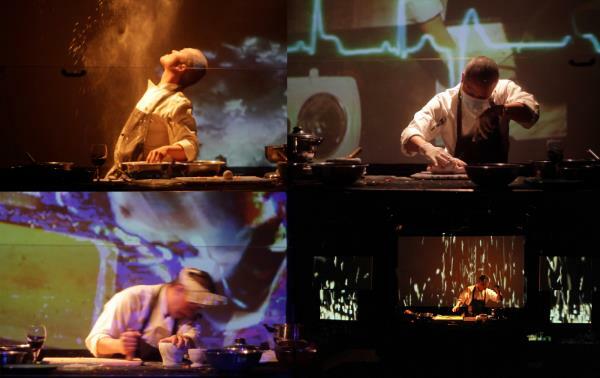 The performance features a dancer (Tony Chong) who is also a virtuosic chef who weilds foods, knives, pans and spices transmuted by gesture-tracking techniques into musical instruments. Within our responsive scenography system, every cooking process is transformed into an environment thick with aroma, light, video, sound, movement, and objects. Every process is experienced across many senses at once. The sizzling sound of hot oil, and the mouthwatering aroma of onion and garlic hit the audience within an audio-visual thunderstorm. At the very end, the audience is invited to taste a sample of the dish within the accumulated sonic environment. “Cooking” is the first part in a series of performances exploring how everyday gestures/events could become charged with symbolic intensity. We use responsive media to poetically charge everyday actions and objects in ways that combine sound and visual composition with the participant’s contingent nuance. As the participants grow accustomed to the instrument’s responsive quality, everyday gestures may become aesthetically invested or charged with emotion or social meaning. Participant’s gestures not only lead to unexpected musicality but to narratives about shaping relationships with the world. “Practices of everyday life” synthesizes state of art techniques in continuous gesture tracking and sonification in a paradigm of calligraphic gestural media developed at the Topological Media Lab. Technical methods include corpus-based concatenative synthesis, haptic-acoustic transcoding, granular processing, physical models, real-time machine-learning, and gesture following.